2016 has been a whirlwind year for our family. I know the world has viewed it as a rough year due to the election and so many celebrity deaths but we’ve viewed it as a rough year for much, much more personal reasons. So much of the “rough stuff” we’ve faced has lined up so strangely perfectly with our plans to adopt. 1. We made the official decision to adopt in late April. Zach had to have back surgery a week later. 2. We made our adoption plans social media official in late June. That same day my “face gate” situation happened. 3. We got home study approved in mid-September. A week later Zach had his first episode that we now know was a precursor to MS.
Never in my LIFE have I felt called to do something the way I have felt called to adopt. It wasn’t in our plans (and we all know how much Zach and I live by our plans!). It wasn’t on our radar. It wasn’t something we were considering or planning or even thinking about. Yet God led us to it in such clear, obvious ways. Ways I’ve never personally experienced before. Everything He kept revealing to us lead to ONE path and that is adoption. Almost instantly when we made that decision, the decision to follow God, to let Him lead us, Satan got on the attack and he’s continued to attack us since. He didn’t only attack in those three things I mentioned above (although those were among the biggies in our rough year). He hit us financially, he hit us with pets dying, he hit us with fear and doubt about our adoption, he hit us with plumbing issues, house issues, family issues, heck in MRSA issues. One thing after another. Satan just kept pounding us. And when September hit and Zach’s long-term medical issues were discovered, I hit my rock bottom. I couldn’t even fathom continuing with adoption. I couldn’t fathom adding a baby (who may have needs of his own) into our family. I have three kids, a home to care for, and now a husband who may also need more of my care. Zach is the breadwinner and with his medical situation comes days missing work which means less income. It also means more expenses with drs visits and potential medications. The human side to me let’s Satan win. It lets that fear just consume me. If Zach needs more sleep at night, how will I possibly handle night duty every feeding on my own? How will I function taking care of FOUR kids on so much less sleep? How will we possibly afford to adopt? We can’t take out a loan now! Zach needs to minimize his stress, not add to it. Won’t a new baby only add to stress? Add to financial strains? What if the baby has medical needs? Special needs? How in the world can we manage that on top of Zach’s medical stuff? I can’t handle this. I’m a person who has to carefully manage my plate. If it gets overfilled I have a lot of anxiety and just can’t function. Why sign up for something that is guaranteed to cause that plate to be overfilled? It was my personal motto for this adoption. Even before any of the scary medical stuff happened. Just deciding to adopt on it’s own was a HUGE decision that has been a MASSIVE leap of faith. And now? Now we’re deciding all over again to continue to step out in that faith. In an even BIGGER way than we’d thought we were before. God has led us to adopt. If we turn back now, what is that telling Him? I know more than anything that it would be a slap in His face. It’d be saying to him that we don’t care what HE wants. It would be allowing Satan to control our steps rather than following the ultimate path maker on the path HE has decided is best for us. Even in all this “rough stuff” God has continued to be there for us through it. We see ways in which He prepared us for the trials we’d face. We see ways in which He has reminded us that sticking by Him and following His will pays off 10 fold. He’s here. He doesn’t abandon us when Satan is on attack. Blessings still flow. Goodness never falls away. His light never dims. I know many, many people didn’t agree with our initial decision to adopt. People don’t understand it. And I don’t expect them to! Not everyone is called to do the same things in life. The Lord has plans for us all and they are all different. 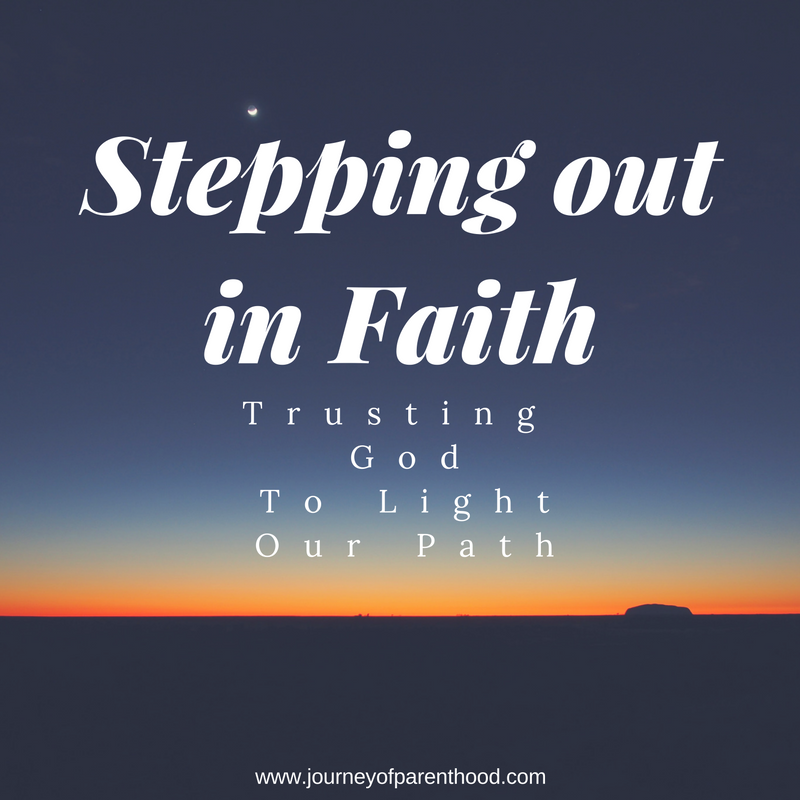 We all have our own ways in which we can step out in faith. This is ours. Now that we’ve found out about Zach’s medical situation, people are even more negative about our plans to continue the adoption. People have said that maybe all this bad stuff happening is God’s way of telling us NOT to adopt. Y’all. God doesn’t work that way. He doesn’t operate by fear. When in doubt whether or not something is coming from God or Satan (and yes, sometimes it’s tricky to tell!) just step back and look for the fear. If there is fear in it, then it’s not from the Lord. And all this bad stuff? It’s just caused FEAR in our hearts and we KNOW that’s not God telling us not to adopt. It’s Satan trying to stop us. God clearly has HUGE favor in adoption and in our plans to go down this path. He clearly has HUGE blessings in store for this child or else why would Satan be trying so hard to prevent it from happening? People may think we are crazy. But a whole heck of a lot of people thought Noah was crazy too. I’ve had several people tell me that the year our family has experienced reads like a story straight out of the Bible. And I agree! I want our story to be one of faith. One that points to the Lord and one that can inspire others to follow Him as well. I recognize that many, many of the characters in the Bible never lived to see the purpose of their paths. Maybe we won’t see God’s plan in all of this during our lifetime. Maybe the child we adopt will have a child and that child will have a child and THAT child’s life is where the plan is revealed. I’m totally 100% fine with rejoicing in Heaven and not knowing until then what this grand purpose is. Even when I’m scared. Even when the future is so up in the air. Even when it feels like my plate is too full to carry. I trust in Him. Zach and I are 100% on the same page (he actually never wavered on the decision to adopt) and we will continue to step out in faith for our Lord.